ONTARIO >> Northview and San Marino high schools have been the area wrestling kings the past two seasons and they showed off their dominance Saturday. 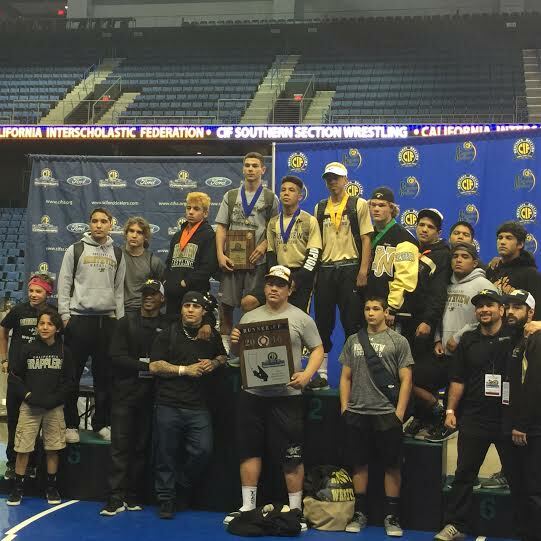 The two area powers combined for seven individual titles at the CIF Southern Section Masters to finish second and third at Citizens Business Bank Arena. Calvary Chapel, of Santa Ana, topped the team standings. San Marino scored a meet-best four titles, getting championship efforts from Zander Silva (126), Julian Flores (138) and the twin brothers tandem of Zander (145) and Evan Wick (152). Northview countered with titles from Eddie Flores (106), Richie Casillas (120) and Jackson Serna (Heavyweight). Casillas, Silva, Julian Flores and Zander Wick were repeat winners. Flores also won a state title last season. The area qualified 20 to next week’s CIF State championships at Rabobank Arena in Bakersfield. The other area qualifiers were Northview’s Dominick Arellano (113, fifth), Ricky Marin (132, eighth), Steven Comstock (170, fourth) and Gabriel Ortiz (126, ninth); San Marino’s Aaron Padilla (160, eighth); Bishop Amat’s Sidney Flores (113, sixth); Gladstone’s Mario Barios (120, eighth); Walnut’s Micah Maes (160, seventh); Charter Oak’s Vincent Zavala (132, fifth); Santa Fe’s Damian Valdez (106, ninth); Rowland’s Ethan Vistro (195, sixth); California’s James Udell (220, ninth) and South Hills’ Austin Moreno (285, ninth). Northview led the area and section with seven qualifiers. Casillas was also lower-weight MVP after scoring two wins by fall and one by technical fall. He beat La Quinta’s Joe Avila, 8-4, in the final. Julian Flores, who won at 132 at the state championships last season, had one of more dominant finals, easily beating Mater Dei’s Devin Pacheco, 16-2, to take the 138 bout. He also had two wins by fall en route to the final. “Winning two Masters titles is a blessing,” Flores said. “My first two years, I didn’t do well, so it’s a blessing. It’s an accomplishment. Evan Wick, who was second last season, used a late takedown to score a 3-2 win over Riverside King’s Luke Troy, who transferred from San Marino. Rowland’s dream season ends: The Rowland girls basketball team’s record-setting season came to an end against Agoura on Saturday. The fourth-seeded Chargers came from seven points down in the third quarter to beat the top-seeded Raiders 43-41 in a CIF Southern Section Division 2A semifinal game.The Raiders (25-3) won more games than any team in school history and made their deepest run in the playoffs since the 1978 squad, which also lost in the semifinals. How about this finish at La Canada that sent the Spartans to the championship. I”m not sure she got it off in time, but what a heck of a shot. No area girl was on the top of podium at the Girls CIF State wrestling championships Saturday, but the area did get four second-place finishes, while earning nine top-eight medals in Visalia. The area medalists were West Covina’s Jennifer Lopez (116) and Yvette Garcia (160) and Baldwin Park’s McKayla Loza (189). The other top-eight placers were Diamond Ranch’s Trina Nguyen (101, sixth); Walnut’s Mia Dow (121, third); Sierra Vista’s Brianna Vilchis (126, eighth); Northview’s Mia Leon (143, third) and Deidra Valles (150, eighth); Bonita’s Natalie Romero (143, eighth). Gabrielino 7, Rosemead 5 — Christian LeRue pitched a complete game, striking out seven, Daniel Brito went 2 for 3 with two RBIs and Brian Chan went 3 for 4 with two runs for the Eagles (1-0). Bonita 3, Cantwell-Sacred Heart 0 — AJ Woodall pitched a complete game and Nick Peifer and Tommy Delgado both had two hits for the Bearcats (1-0) in a SoCal Baseball Pre-Season Tournament win. San Gabriel 11, Eisenhower 2 — Mariah Serna went 3 for 3 and Marissa Cabrera was the winning pitcher to lead the Matadors (1-0) to the Duarte Tournament victory. Diamond Ranch holds on to advance to finals: In a fitting ending, Diamond Ranch’s Roman Silva blocked Denzel Holt’s 3-point shot attempt at the buzzer to secure a 48-45 victory and a berth in the CIF Southern Section Division 3A boys basketball finals. 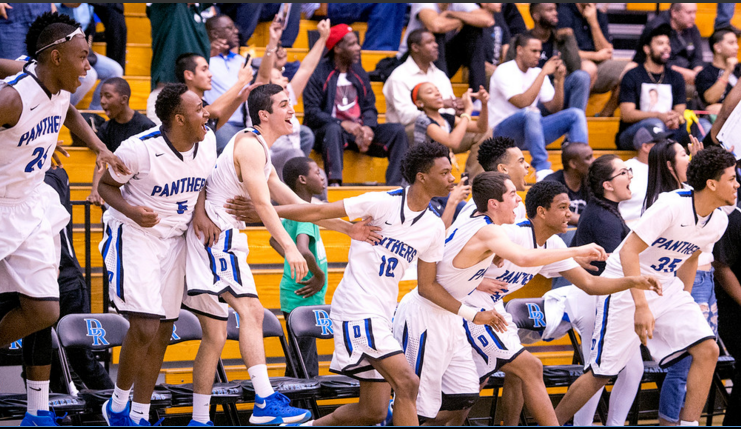 Silva dominated the game on both ends, recording a triple-double with 19 points, 18 rebounds, and 10 blocks.“He (Silva) is the anchor of the defense,” said Diamond Ranch coach Eric Cooper. “And he’s the guy who gets the most attention on offense. He’s our MVP, without him, we go nowhere, he’s a vital part”. Bonita to play for first championship since 1951: The Calabasas boys basketball team was trying to advance to its third championship game in five years Friday.Bonita had other ideas. Tyler Poepping scored 23 points and Joe Quintana scored 22 points to lead Bonita to a 67-56 CIF Southern Section Division 3AA semifinal victory. Not only did Bonita deny the Coyotes a trip to the final, the Bearcats (25-5) atoned for a losing in last year’s semifinals to Gahr. Covina at Desert Mirage, 5 p.m.
Covina in semis for first time ever: Even when things looked bleak, the Covina High School boys soccer team kept after visiting La Canada in the CIF-Southern Section Division 6 quarterfinals on Friday.The patience and persistence finally paid off for the Colts, scoring twice in a five-minute span to turn the tables, winning 2-1 to advance to the semifinals for the first time in school history. Covina (16-3-3) will face the Cerritos Valley Christian-Desert Mirage winner in the semifinals on Tuesday, but it gets the weekend to celebrate its historic run. Gladstone’s dream season ends: The Gladstone boys soccer team’s Cinderella season came to an end against South Torrance on Friday.The seventh-seeded Spartans came from behind to win the CIF-SS Division 4 quarterfinal game, 3-1. Bonita baseball coach John Knott and South Hills coach Darren Murphy, with help from other area coaches, do a wonderful job putting together one of the best 32-team high school baseball tournaments in Southern California, and includes most of the area’s heavyweights like South Hills, San Dimas, Walnut, Chino Hills, Arcadia, St. Francis, and host Bonita. 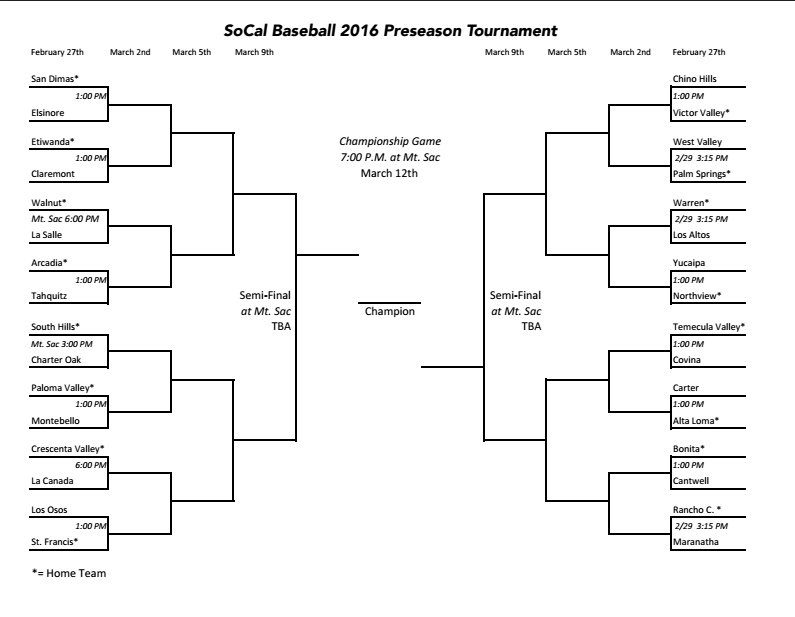 Check out the schedule, it all begins on February 27.